This parmesan roasted brussel sprouts recipe is sure to please even the pickiest vegetable eaters. It not only makes a great side dish on your Holiday table – but is perfect year round. And why not get all that amazing nutrition whenever you can, right? Preparation is pretty simple. The baking process has a couple steps but nothing too time consuming. I usually cut a little bit off the stem end – because they are usually kind of an unappetizing grayish color. Then I cut them in half vertically from the top through the stem end. A few of the outer leaves will fall off as you do this. 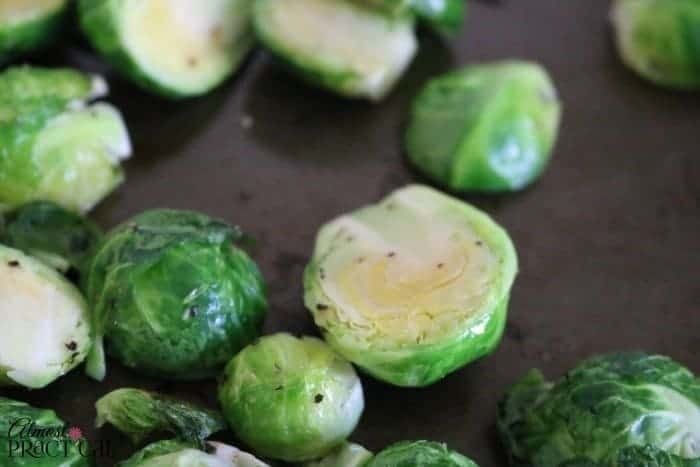 You can keep these in with the brussel sprouts because they get nice and crispy during the roasting process, or you can toss them if you want a more uniform look to your roasted brussels sprouts recipe. Place these in a nice big mixing bowl. Now, measure out four cups of the brussel sprouts halves. It is tempting to skip this step and just use what you've got, but then your seasonings won't be proportionate. 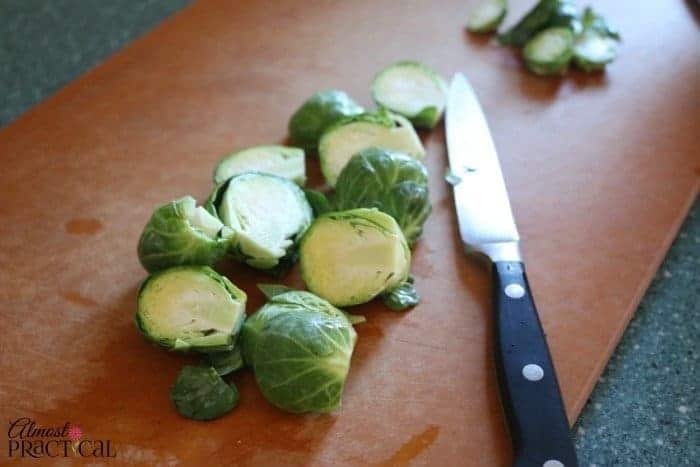 You can certainly use more or less brussel sprouts halves in this recipe but you should know how much you have so that you can adjust the rest of the ingredients accordingly. In a small bowl mix together olive oil, salt, and pepper and stir it up. 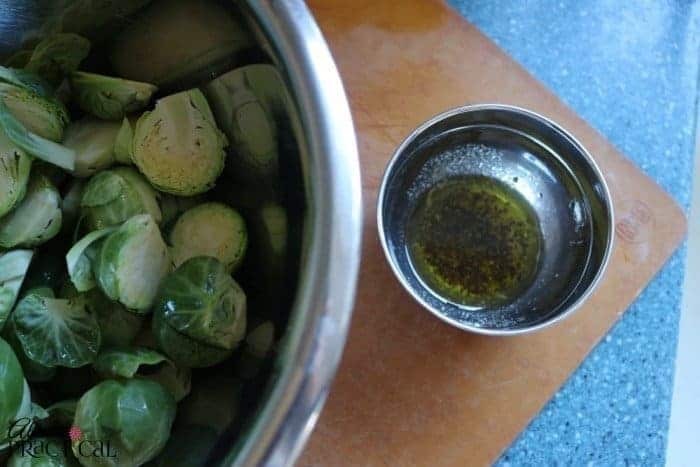 Pour this olive oil mixture over the brussels sprouts and toss to coat. Then place the coated brussels sprouts in a single layer on a nonstick baking sheet , cut side down. For this particular parmesan roasted brussel sprouts recipe we will bake the brussel sprouts in two phases. Bake in your preheated 400ºF oven for about 10 minutes. (make sure you set a kitchen timer ) for the first phase. While the brussel sprouts are in the oven, you can move onto the next step in the roasted brussel sprouts recipe. In another small bowl, mix about a quarter cup of finely grated parmesan cheese with about a quarter cup of italian style Panko breadcrumbs. When your first 10 minutes of baking are up, remove the brussels sprouts from the oven. The cut side should just be beginning to brown and the brussels sprouts should be a bright green color. See below. Dump these partially roasted brussel sprouts back into the big mixing bowl, pour the parmesan mixture over top, and toss to coat all of the brussel sprouts. Return the parmesan encrusted brussel sprouts back to the baking sheet. 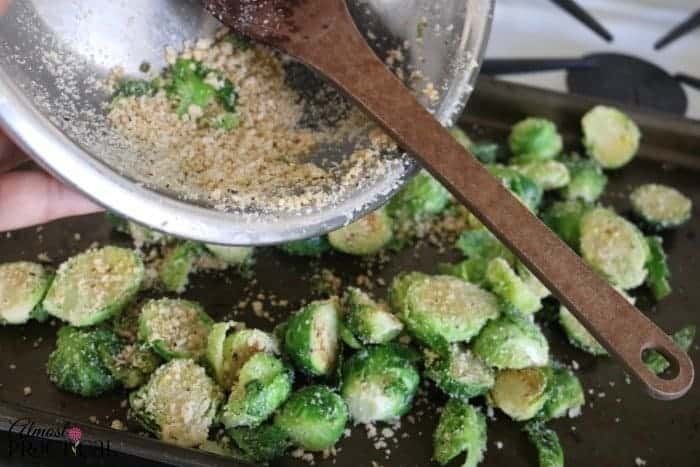 You will have some extra parmesan mixture sitting in the bottom of the mixing bowl and that's ok. You can either discard this or toss it over top the brussel sprouts in the baking pan. Put the brussels sprout back in the oven and roast for about 20 more minutes. Make sure to stir them at about the 10 minute mark so they don't stick, and also so they roast evenly. 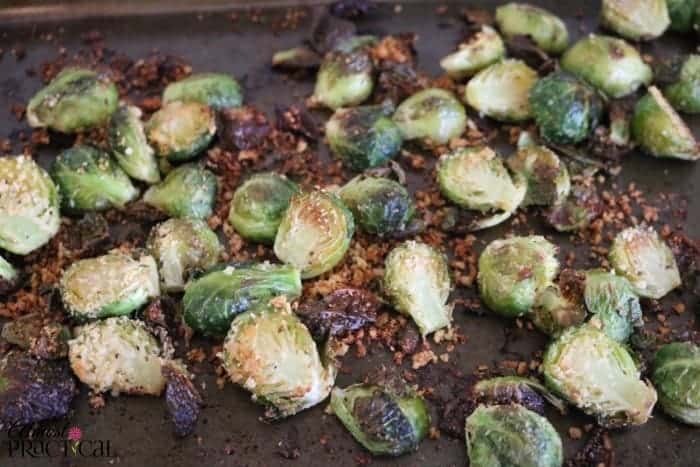 That's all there is to this roasted brussel sprouts recipe. Remove them from the oven, serve warm, and enjoy. Do you have a secret ingredient that makes your roasted brussel sprouts recipe irresistible? Tell us about it in the comments below. 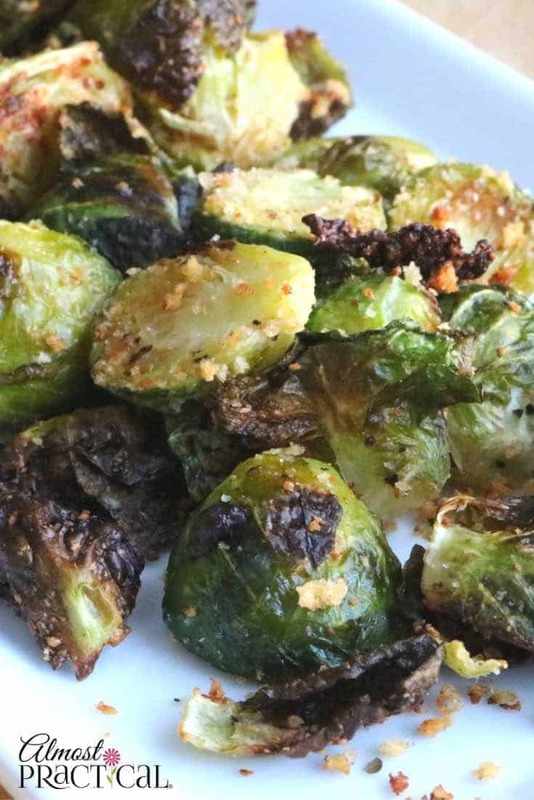 Even the kids will love this parmesan encrusted roasted brussel sprouts recipe. Trim and halve the brussel sprouts. Measure out 4 cups of brussel sprouts halves into a large mixing bowl. In a small bowl mix the olive oil, salt, and pepper. In another small bowl, mix the parmesan cheese and the breadcrumbs. Pour the olive oil mixture over top of the brussel sprouts and toss to coat. Spread coated brussel sprouts in a single layer on a nonstick baking sheet, cut side down. Remove brussel sprouts from oven and return them to the mixing bowl. Pour the cheese and breadcrumb mixture over the warm brussels sprouts and toss to coat. Place the breaded brussel sprouts back on the baking sheet. It is not necessary to place them cut side down. Return to oven and bake for 20 more minutes - stirring at around the 10 minute mark so they don't stick and so they roast evenly. 12. Remove from oven, serve warm, and enjoy.